The ISO 9001:2015 Certification Package is ideal for those seeking all the materials and instructions needed to implement an excellent ISO 9001 quality management system and quickly achieve ISO 9001 certification. The ISO 9001:2015 Project Guide is a practical, no-nonsense handbook for your ISO 9001 implementation. These easy-to-follow, step-by-step instructions guide your ISO 9001 implementation project from start to ISO 9001:2015 certification and beyond. 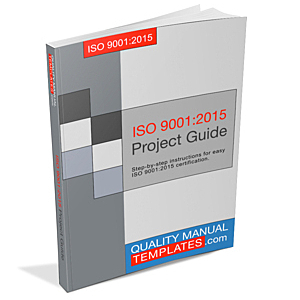 You will use the ISO 9001:2015 Project Guide as the very first tool to get started with your ISO 9001 implementation. 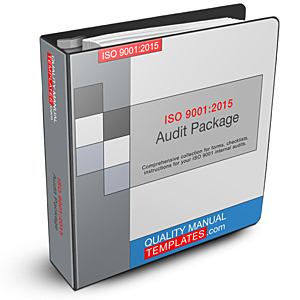 The ISO 9001:2015 Project Guide will then guide you step by step, reference the other materials included in the ISO 9001:2015 Certification Package and explain how to use them. The instructions are simple yet complete and easy-to-follow, and the entire guide is very business-oriented. 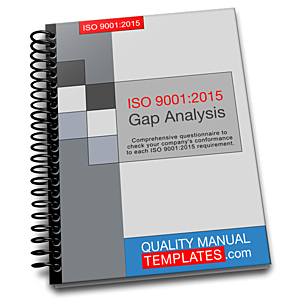 The ISO 9001:2015 Gap Analysis is a tool to evaluate how difficult and extensive the ISO 9001 implementation at your individual company will be. The resulting information will help you plan and budget for your ISO 9001 implementation. The ISO 9001:2015 Gap Analysis consists of a questionnaire and checklist that is used to analyze the extend to which your company's processes already comply with ISO 9001:2015 requirements. Microsoft Word format allows you to fill in The ISO 9001:2015 Gap Analysis on your computer. 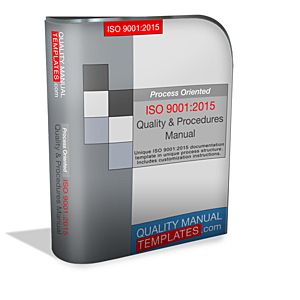 The Process Oriented ISO 9001:2015 Quality & Procedures Manual is your main template for your entire ISO 9001 documentation, including over 40 procedures (addressing all ISO 9001:2015 requirements), the quality policy and the process flowchart. You will use the included step-by-step customization tutorial to guide you through the customization; you will be surprised how easy and fast it will be to develop your company's individual ISO 9001 documentation based on this template. Even more important than the ease of customization is the quality of the ISO 9001 documentation, and this is where the Process Oriented ISO 9001:2015 Quality & Procedures Manual excels: your ISO 9001 documentation will be user-friendly, non-bureaucratic and a valuable tool for business improvement. 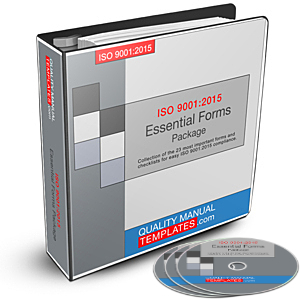 This comprehensive ISO 9001 documentation template is uniquely structured according to the ISO 9001:2015 Processes Approach. The result is exceedingly user-friendly ISO 9001 documentation. Microsoft Word format for easy editing. Includes step-by-step customization tutorial. Microsoft Word format for easy customization as needed. The ISO 9001:2015 Certification Package includes free and unlimited customer support. You can always contact our experts in ISO 9001 compliance for assistance. The ISO 9001:2015 Certification Package is delivered through electronic download - so you can start customizing it today! We offer you the easiest way to achieve ISO 9001 certification. The ISO 9001:2015 Certification Package includes all the templates, forms, checklists, instructions and tools needed to achieve ISO 9001 certification in-house without consultant - even beginners without prior ISO 9001 experience can do it. Use our new ISO 9001:2015 upgrade packages for the easiest way to upgrade your ISO 9001:2008 quality management system to meet the requirements of ISO 9001:2015. To pay by wire transfer, please email us for pro-forma invoice. © Copyright 2006 - 2018 - QualityManualTemplates.com - All Rights Reserved.